The two song cycles are settings of poems by Joseph von Eichendorff (Liederkreis) and Heinrich Heine (Dichterliebe). 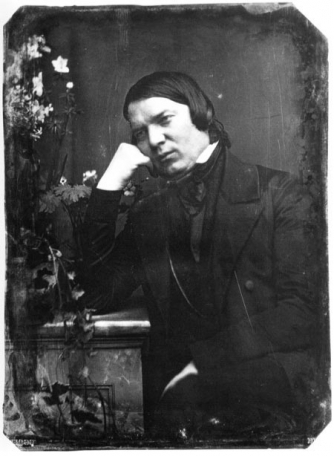 They were written in 1840, when Schumann was preparing to marry his great love, the concert pianist Clara Wieck, in fact it is likely that he was working on both sets of songs concurrently. The first group of 12 songs (Liederkreis) are difficult to pin down to one theme, but have in common an atmospheric landscape setting, a strong emotion, either love, loss or nostalgia, and the feeling of some impending event, mostly tragic but finally happy. Dichterliebe comprises 16 songs, and these concern much more directly the joys and sorrows of love, and are inspired by the estrangement and reunion that he and Clara had been through. Both cycles are widely thought to include some of Schumann’s greatest music. ​Charles Luxford, bass-baritone, put the corporate world behind him roughly ten years ago to return to music making. Since he and David collaborated on Schubert’s Winterreise at the 1901 Arts Club last year, Charles has moved to Alnwick where he's easing himself into a vibrant music scene. The pair's deep enthusiasm for lieder has however, drawn Charles south for regular rehearsals - with particular focus on the repertoire of Robert Schumann. Dichterliebe has been a favourite cycle since Charles' college days, with Liederkreis Op.39 a recent discovery. The process of working together has induced new academic and musical highs and a longer-term plan to reprise their collaborations 'up north'. ​David Evans studied piano from the age of 7. He retired from a career as a hand surgeon in 2013, and took up more serious piano studies at Morley College, joining Gwenneth Pryor’s "advanced performers" class. His main interest is in music involving other performers, and the collaboration with Charles in the lieder repertoire has been very rewarding. Working Hands is a surgical charity run by Donald Sammut, a Bath-based hand surgeon providing care since 1999, mainly of leprosy patients in India and latterly in Nepal. Twice a year he leads a team to Nepal to treat patients with leprosy and burns, restoring movement and strength to paralysed and stiff hands. Most of these patients are illiterate farmers whose livelihood depends on what they can dig carry or haul in a day's work. Importantly, the team also teach and train local surgeons in this surgery, so that they can carry on the work throughout the year. The Charity depends entirely on voluntary contributions and donations. All members of the team give their time and expertise pro bono. All donations find their way directly to the work of each trip and to provision of essential instruments and kit.